Search the DuBois Public Library’s collection, review your patron account, renew your items, and reserve materials. *To access your account, your library barcode & a pin number is required. Please contact the library if you need those numbers. If you need your history from the old system, please email us and we can print or email your history for you. Download audiobooks & e-books to your computer, e-reader (including Nook and Kindle) and/or mp3 player. ​Help Grow Your eBook Collection - Donate Today! A collection of TumbleBooks (animated, talking picture books) with fiction, non-fiction and foreign language titles, Read-Alongs (chapter books with sentence highlighting and narration but no animation), TumbleTV includes pre-set playlists of a sequence of books, Tumble Puzzles & Games, and TumbleResources for teachers and students. We also have National Geographic videos which we’ve paired with many of our non-fiction titles – perfect support for the Common Core Curriculum! Get help from a Pennsylvania Librarian 24 hours/day, 7 days/week. POWER Library e-resources provide access to thousands of full-text periodical articles, newspapers, a major encyclopedia, photographs, pictures, charts, maps, and reference material for Pennsylvanians of all ages. 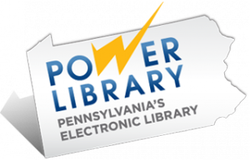 The POWER Library is a service of Pennsylvania’s public libraries, school libraries, and the State Library. The Central PA District Library Center supports and enhances the resources and services of the public libraries in Centre, Clearfield, Juniata, and Mifflin counties. Mengle Memorial Library provides free library cards to residents of Brockway Area School District and provides free library service to all Jefferson County residents. Offers visitor and business information for the City of DuBois. Features the leading books sold this week according to the New York Times Newspaper. Regional resources for health, community, and financial. A project of ILEAD USA. The official tourism site for the Pennsylvania Wilds region of North Central Pennsylvania Counties.